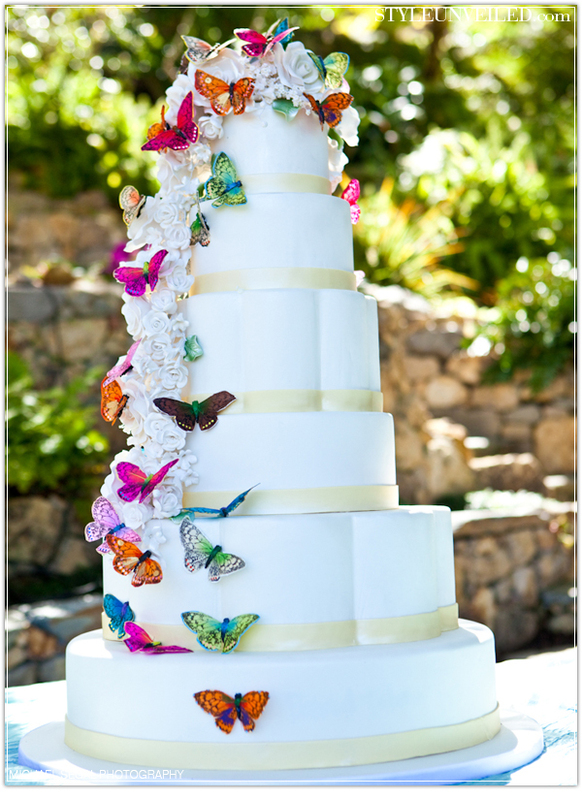 Another great spring theme for weddings is butterflies. This theme would be great paired with the garden or bird theme. (Please see my previous posts.) The key is to not go overboard. The last thing guests want to see are butterflies everywhere they turn. Another thing to avoid is going too cutesy. You don’t want your wedding to look like it was designed by a sixteen year old. Some subtle ways to incorporate this theme are through centerpieces, party souvenirs, table settings, and the wedding cake. These are all places where guests will take notice. 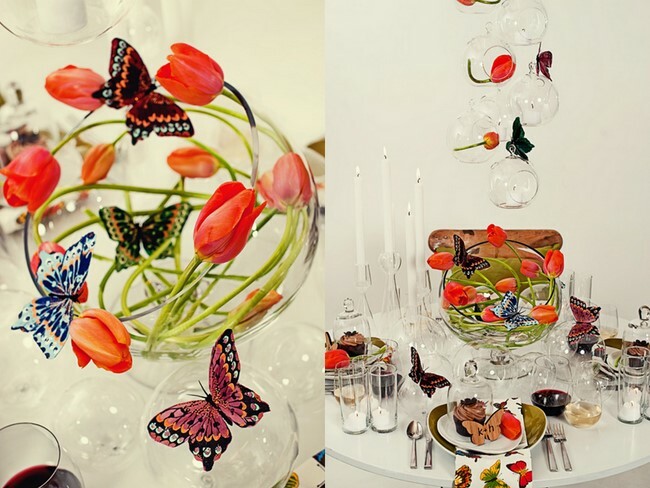 For centerpieces, a floral arrangement with a few butterflies can still be modern yet whimsical. Just check out this inspired design by Kate Miller Events and Flourish, captured by Sarah Maren Photography. If you are aiming for a more subdued color scheme, then try something monochromatic. 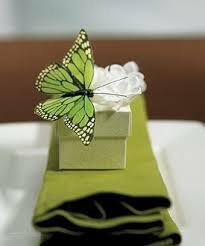 Choose butterflies in one shade and add a neutral such as white, tan, gold, or silver. Green can also act as a beautiful base color. 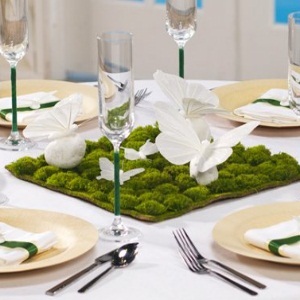 A great example is this clean yet modern square centerpiece with moss. For party souvenirs, think about small trinket boxes filled with chocolates or other sweet treats and adorned with feather butterflies. What guests wouldn’t want to take these home? If you are not doing centerpieces or have something else planned for centerpieces, this same concept could also be applied to the table setting. 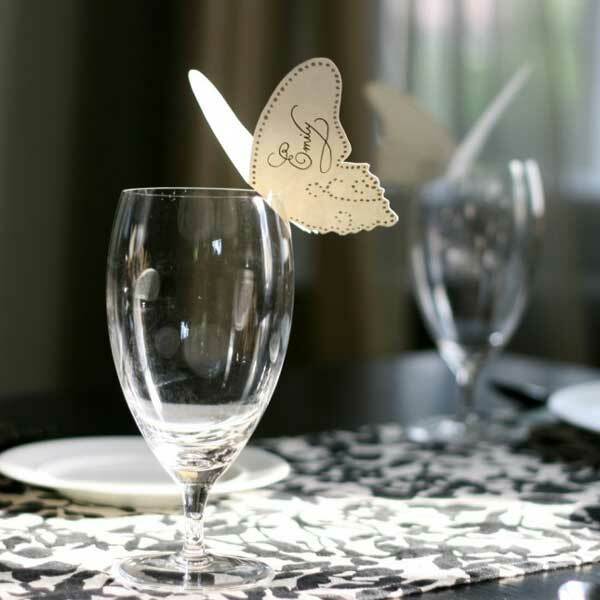 Perhaps a custom paper butterfly sitting atop each person’s champagne or wine glass? It is an unexpected touch that instantly feels person. You should avoid, however, using the theme on both, the souvenirs and the table settings if they are both sitting on the table. It might be overkill. Aside from the above ideas, the wedding cake is perhaps the most exciting way to feature this theme. Butterflies can be beautiful when painted onto a pure white backdrop. They are equally dramatic when sculpted from sugar (albeit a bit more expensive). If you are looking for the same impact but for less expense, then you can always use a dozen feather butterflies. 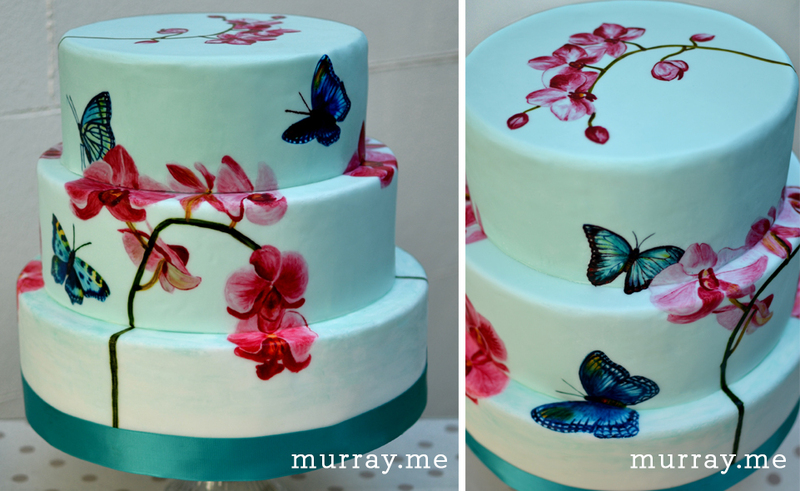 Check out this amazingly gorgeous painted butterfly cake! It’s like edible art! 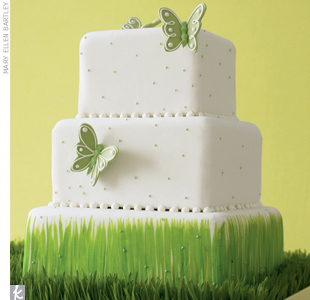 Here is also a modern monochromatic cake with sugar flowers and another colorful example using feather butterflies. 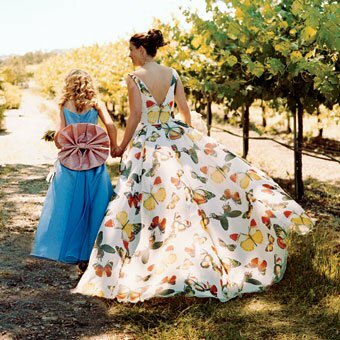 This might be a bit too much for most brides, but don’t you also love this beautiful butterfly printed dress? Couldn’t quite figure out who makes/made it but it’s absolutely stunning!